A deep, rich, chocolate-colored soap scented with the exotic, earthy and unmistakable note of pure East Indian Patchouli essential oil. 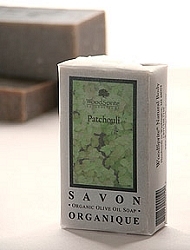 Patchouli oil is excellent for dry skin and, despite its earthy scent, is considered in aromatherapy to be an anti-depressant, mood booster and even an aphrodisiac. The addition of organic cocoa butters puts takes the moisturization factor over the top! Ingredients: Saponified *Organic Extra Virgin Olive, *Organic Coconut, *Organic Palm & *Organic Sweet Almond Oils and Superfatted with *Organic Fair Trade Cocoa Butter; Pure East Indian Dark Aged Patchouli Essential Oil and *Organic Black Walnut Hull. (*Certified Organic) Normal to dry skin. 4 oz. wt. This is the best patchouli soap we've ever used. Very high quality.